Over the past month we have talked a lot about goal setting on this blog. We have taken an idea and painted it in our minds. We have taken the outline of the goal and written it down. Now it’s time to fill in the pieces. Goal success comes down to daily actions completed over and over. Over the years I have tried many things to help me with my daily activities and that never ending to-do list. 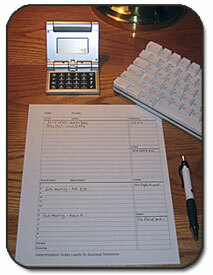 I’ve worked with Outlook, tried many paper based planners, and even worked with a Treo Smart phone. What I always come back to is a piece of paper on my desk. It may be a legal pad, a small notebook or just a post-it note. I make notes on the paper, write down phone messages, and list e-mails that I need to send. The paper sometimes becomes a mess of scribbles and notes. The general concept works well for me but things sometimes get lost in the shuffle. A few weeks ago I decided to organize my sheet of paper into boxes that will hold my common activities. This little organization hack has worked wonders for me. I now have a common letter size sheet of paper broken up into useful areas. There is a place for phone calls that I need to make, e-mails that I need to send, and a create box for accounts that I need to setup. The sheet is setup in a blog style format, with a large center column for to-do activities and appointments and a right sidebar for the smaller boxes. I’ve experimented with different box sizes and ended up making everything as uniform as possible. I added a success quotation to the bottom of each sheet to remind me of my priorities. This simple sheet of paper has really helped me organize my daily activities. Now when my users call and need me to set them up an account, I can list it in the create box and it will get done. The telephone list is always visible which allows me to group callbacks, along with the e-mail box that groups e-mail responses so I don’t forget them. I also created a weekly sheet which helps me plan out my week. I keep this on my desk under the daily sheet for reference. When I have something that I need to schedule later in the week, this sheet works wonders. Even though I still use Outlook for my calendar, a quick note here reminds me of the appointment. Since this simple system works so well for me I decided to make a couple of standard versions that may work for you. I designed these in Microsoft Publisher for the greatest flexibility. Publisher allows you to move boxes with ease and align elements with precision. I realize that many people may not have Publisher installed on their machines so I have also included a non-editable PDF version. 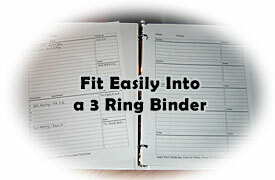 There are three templates to choose from. Each template includes a Microsoft Publisher file and a non-editable PDF (Acrobat) file. These are designed for standard U.S. Letter size paper. Just download and unzip the file. Open the file in Publisher and modify as necessary. Print out on standard weight white paper. If you don’t have Publisher use the included PDF file instead. When you are done with your daily sheet at the end of the day, just three hole punch it and store it in a notebook for future reference. If you use a weekly sheet, store your daily sheets behind it. This will quickly build a daily journal that you can reference in the future. It’s simple and it works.